Pernell Walker and Flor De Liz Perez in Dolphins and Sharks. Photo by Monique Carboni. BOTTOM LINE: Issues of race, class, and gender cause conflict among co-workers living paycheck to paycheck in this well-acted drama set in a gentrifying Harlem. In Dolphins and Sharks, a new play by James Anthony Tyler, one of the most important figures is entirely unseen. Mr. Timmons, the owner of the copy and print shop in which all the action takes place, is talked about in every scene but never appears. He doesn’t have to: the power he wields over his staff and, by extension, the community is great enough that his presence would be superfluous. Indeed, his employees comment repeatedly on the fact that he never comes around. Significantly, Mr. Timmons is white, unlike any of characters we see onstage. Directed by Charlotte Brathwaite, Dolphins and Sharks continues the trend we’ve seen in the last few years of dramas about workers (sometimes black and brown, sometimes not) in dying or obsolete industries, and how their loyalties are tested when their livelihoods and dreams are threatened; last year’s Skeleton Crew and this year’s Sweat are just two examples. 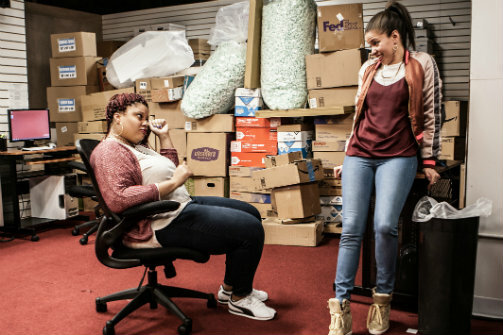 Dolphins’ central characters are Xiomara (Flor De Liz Perez) and Isabel (Pernell Walker), two longtime employees at the shop who consider themselves “homegirls.” When recent NYU grad Yusuf (Chinaza Uche) comes for a job interview, the women are both amused and skeptical: why does a guy like that want to work in a place like this? However, shared contempt for Yusuf soon gives way to increasing animosity between Isabel and Xiomara, as one of them is promoted to a management position, becoming her former homegirl’s superior. Dolphins and Sharks deals unsentimentally with the legacy and persistence of race prejudice, not only from whites against people of color, but among people of color with different ethnic and class backgrounds. The Nigerian-American Yusuf, raised in Staten Island, is scared of the Harlem neighborhood where the copy shop is located; Isabel, who is black, makes fun of Xiomara’s traditional Dominican name behind her back. The play is also honest about the conflicts some minority or immigrant individuals face within their own communities: Xiomara desires financial independence, but her mother pressures her to find a husband, while Yusuf’s parents can’t understand why he majored in philosophy instead of science. The drama that results from these overlapping conflicts is absorbing, and the excellent cast (rounded out by Tina Fabrique and Cesar J. Rosado) goes all in. Director Brathwaite and her design team have created an almost-immersive environment for the action to play out in. Marsha Ginsberg’s meticulously detailed set, complete with stacks of boxes overflowing with office supplies, contrasts effectively with Andrew Schneider’s video design and Kent Barrett’s lighting, which between scenes take us and the characters into a otherworldly realm where music, noise, movement, and flashing color supplant dialogue and plot. These spectacular interludes are not the only part of the production that aim for impact over subtlety, however: from time to time, Tyler’s dialogue puts his message right into the characters’ mouths, turning what is mostly an extremely well-crafted portrait of a specific environment into a polemic. Despite leaning a bit too much on metaphor and putting into the text what’s already clear from subtext, Dolphins and Sharks is an engaging addition to the theatrical conversation about the people American capitalism has left behind. Its detailed evocation of time and place indicates that Tyler is a playwright to watch. His work is all too relevant to our current moment. Dolphins and Sharks is by James Anthony Tyler. Directed by Charlotte Brathwaite. Scenic Design by Marsha Ginsberg. Costume Design by Zulema Griffin. Lighting Design by Kent Barrett. Original Music & Sound Design by Justin Hicks. Video Design by Andrew Schneider. Production Stage Manager is Samantha Cotton. The cast is Tina Fabrique, Flor De Liz Perez, Cesar J. Rosado, Chinaza Uche, and Pernell Walker.